The Anambra State Police Command has paraded 21 suspects arrested for various crimes in the state. Briefing newsmen at the Command Headquarters, on Tuesday, the state’s Commissioner of Police, CP Garba Umar, said one John Okwudili from Issele ukwu who defrauds unsuspecting members of the public by impersonating Governor Willie Obiano on Facebook has been arrested by the state Police Command. Mr. Okwudili, an internet fraudster, aged thirty, was tracked and arrested by men of the Special Anti-robbery Squad. “On the 9/7/2018, following rising cases of internet fraudsters, operatives attached to Special Anti-Robbery Squad tracked and arrested one Okwuduli John male, aged 30yrs of Delta State. Suspect belonged to internet fraudsters popularly known as “Yahoo Boys” who fraudulently obtain money under false pretense from innocent victims. He is also involved in using fake facebook account and impersonating prominent persons including that of His Excellency Governor Willie Obiano in order to defraud his victims.” said the police boss. Speaking to journalists, Mr Okwudili said he had made one hundred and ten thousand naira since he started operating the fake Facebook account bearing Governor Obiano. According to him, he usually targets people who are looking for work. 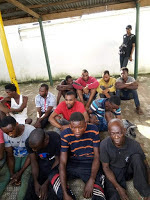 The police also arrested twenty other suspects, aged between twenty and twenty five, for various offences including armed robbery, and cultism. -Tochukwu Obi and Cheta Obi, all males and members of Aiye and Vickings Confraternity. -Ten live cartridges and other working tools used in servicing guns. -Kosiso Ozor male, aged 18yrs, suspects conspired on the 11/7/2018 at about 1200hrs and robbed one Blessing Nwannli along Umumli Ihitte, Azia in Ihiala LGA of Anambra State. On July 22, following intelligence report Police detectives attached to Obosi in conjunction with Vigilante Group arrested one Emmanuel Chokodili male of Umuota Village Obosi. Suspect was arrested with a fabricated gun and one expanded cartridge. Preliminary search into his shuttle bus led to the recovery of another sharp cutlass which he could not give account of. Ifenna Anierobi male, aged 20 years. The suspects conspired and robbed one Dr. Ojiakor Samuel Chukwudi of Gerald specialist hospital Okpuno and carted away his handsets and other valuables. They have voluntarily confessed to the crime. 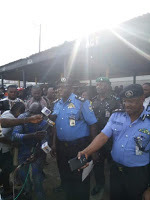 The police also arrested six-man robbery syndicate who, intercepted a trailer loaded with Dangote cement along Onitsha/Owerri road on the June 9, and carted away all the cement inside the trailer. 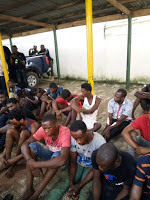 Police operatives attached to the command special Anti-Robbery Squad (FSARS) arrested the syndicate at Oba in Idemili South LGA of Anambra State on June 29, following intelligence report. Further investigation led to the arrest of the two receivers of the stolen goods, Onuchukwu Chinedu, and Eze Levi, 38. CP Umar warned that the police will not relent in its efforts to stem the tide of crimes and criminality to its barest minimum as it has taken proactive steps towards reducing crimes in the state. He counted visibility policing, criminal mapping, intelligence led policing, constant raids of black spots and criminal hideouts as some of the measures adopted in the battle Against criminals. Commissioner Umar, stressed that the success story was made possible through the cooperation of the citizenry and determination to engender a safe and secure environment for all residents in the state and called on Ndi Anambra not to relent in their support to security agencies in the state. All cases are under investigation after which suspects would be charged to Court for prosecution. Police Arrest WAEC Question, Answer Syndicate. Fake SARS Operative Arrested In Edo State.